Pasta is the simplest of Italian foods. It is the most widely known and can be found all over the world. But it is easy to go wrong with it and to end up with a soggy uninspiring mess. As with all the most basic foods the key to cooking good pasta is to choose good quality ingredients. The simpler the food the more important quality becomes. Poor quality can be less easily disguised in a simple pasta dish than in something more elaborate. Good quality pasta is made from durum wheat. Many people swear by fresh pasta rather than dried. They feel that fresh pasta must be more authentic than dried. But in Italy cooks will often choose dried pasta for preference. A good quality dried pasta made from durum what is always preferable to a poor quality fresh pasta. What you are looking for is a dried pasta made with 100 per cent durum wheat and preferably made by an Italian company according to traditional methods. Avoid supermarket own brands and other cheaper substitutes. Only the real thing will do. If this seems too expensive then save money when it comes to the sauce. Pasta is a cheap food because it carries the sauce and makes expensive ingredients go further. You should not think of pasta as an economical food because the pasta itself is made from cheap ingredients. Some fresh pasta is excellent. If you can find shop where they make it themselves it is well worth buying. You might even like to try making it yourself. There are wonderful gadgets for rolling out sheets of pasta. But these pasta machines usually end up forgotten in the back of the cupboard. They are not really necessary. You will rarely find them in an Italian kitchen. Home made pasta can be made quite easily with a rolling pin and a knife. Home made pasta is particularly good for filled pastas such as ravioli. You can make your own filling to your own taste that way. Whether you make your own pasta, buy fresh pasta or dried pasta you will need a large pan in which to cook it. When I say large, I mean larger than you think. Most pans are too small to cook pasta successfully. The pan should be made of a material that is a good conductor of heat. 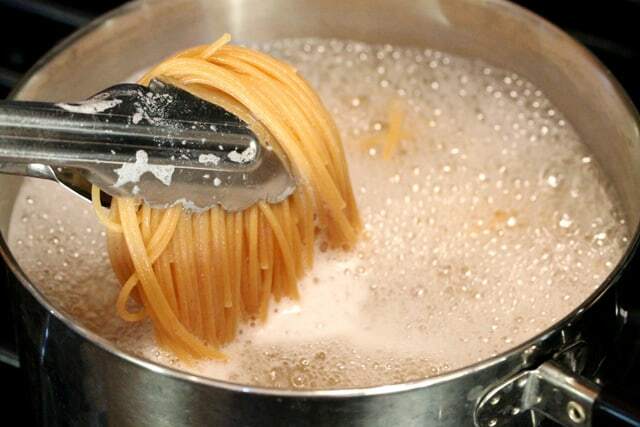 Many stainless steel pans are not good conductors of heat and will let your pasta sit in the water going soggy. The reason that you need a big pan for pasta is that the secret of cooking pasta is to have plenty of water. That way the individual pieces of pasta are kept separate and do not stick together. The water must be brought to a good rolling boil before the pasta is added. Bring it back to the boil as quickly as possible after the pasta is added and keep it boiling until the pasta is done. Do not put a lid on the pan. Salt is important in cooking pasta. The water must be well seasoned with salt for pasta. Without salt you pasta will be bland and dull. Some people like to add oil to the water. They believe that this will stop the pasta sticking together. This is not true, because the oil stays on the surface of the water and does not touch the pasta. But oil can help to prevent the foam that is produced when cooking pasta from boiling over the side of the pan. Most packets of pasta have a cooking time printed on them. Treat this as a rough guide only. You must judge whether or not the pasta is done by touch. Lift out a piece of pasta from the boiling pan and squeeze it between the nails of your thumb and forefinger. If there is still a slight resistance then the pasta is done. It is, as the Italians say, al dente. There is some “bite” left in it. Your pasta is then ready to serve with the sauce of your choice. Abhishek is really passionate about Cooking and he has got some great Cooking Secrets. up his sleeves! Download his FREE 88 Pages Ebook, “Cooking Mastery!” from his website http://www.Cooking-Guru.com/770/index.htm. Only limited Free Copies available.